I don’t mind so much, but I often want to remind these grown adult humans that they WALKED INTO A BAKERY. The treats here are tasty and they are loaded with sugar, but you made the choice to walk in the door. I looked up just in time to see her face burst into a grin. I chuckled. I didn’t expect to be handing out wise words with espresso at 8am on a Thursday. A week later Marilyn was in again. Armed, as usual, with exact change and a smile. When she made it to my end of the bar for her macchiato she reminded me of our previous conversation. “You changed my life the other week,” she told me. “I remember.” And I did. But I didn’t think I had offered something special. Only something true. “I have been trying to say yes to myself too,” she announced. “And I have been sharing that wisdom with all of my female friends. Your words are making their way around the world. You are really making an impact,” she said. I could hardly believe what a beautiful moment we were having. Me standing there with my apron pockets full of coffee grounds and her small frame growing larger with sheer enthusiasm and her bright eyes getting brighter by the minute. It was the highlight of my week. It might stand as the highlight of this year. This year I am saying yes to myself. I have already spent too much time on no. Time following strict rules connected to a faith where all I can find is talk of freedom and love. Time spent saying no to self-care and self-love. Now I say yes to myself. Yes to outlandish dreams, but also yes to small ideas. 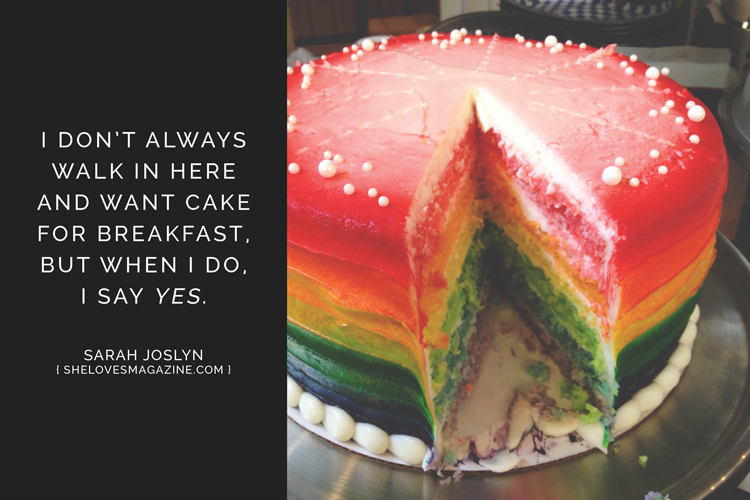 Yes to living healthy and also yes to cake for breakfast. Yes to staying in bed on my day off and yes to going out to a party alone. Yes to writing the hard stuff and yes to letting my snark and swear words fly. Yes to kissing strangers and yes to my instincts to cut them loose. Yes to silly haircuts and yes to comfy shoes. Yes yes yes.